Two weeks ago on a lazy Sunday I felt like going to the Zoo. I had slept too long, so it had already been after noon…in other words too late to take the train to Munich to enjoy a full day with the animals. I may have been a little grumpy, when suddenly at three o‘ clock b. called and asked me to go to the Zoo, NOW. 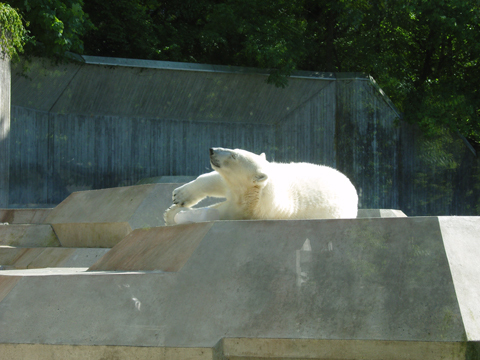 His family was driving by car to Munich anyway, so we could hitch a ride and take the subway to the Zoo. We had only two hours (had I refused to go there before because we weould have only had some hours??? ), but we enjoyed those to teh fullest. It was so much fun to go there spontaneously, even more fun than a planned visit could have ever been. 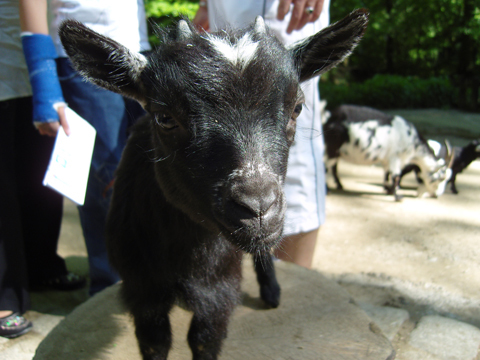 First we visited the petting zoo with its young goats. We were able to pet them, carry them around, whatever we wanted. The goats were so relaxed and seemed to enjoy the contact with humans (the had the chance to leave the petting zoo and back out). The weather was extraordinary, so I was able to take many wonderful pictures. Here you can see a rhino and even the saliva that drops from its mouth. Doesn’t he look so very laid-back? I’d like to change places for a sunny afternoon! 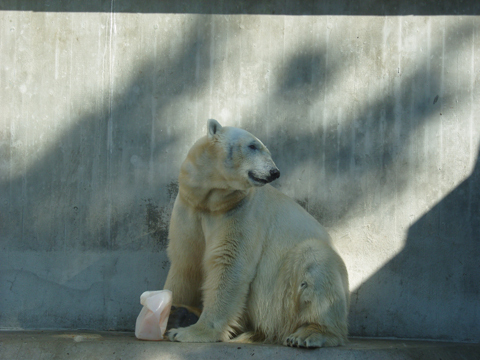 Another polar bear at feeding time. Please, look at his face! 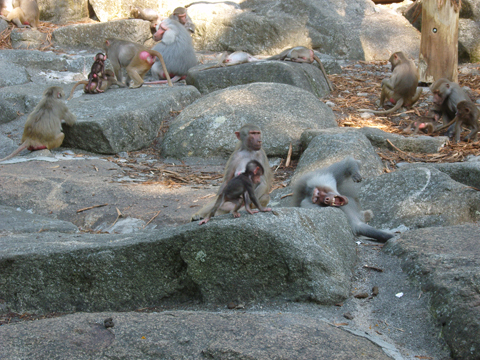 The baby monkeys were so tiny, but also very nosey. Its mother was lazy and didn’t want to look for the baby every second, so she just grab its tail like a leash and so it was aloud to play freely in a limited radius. 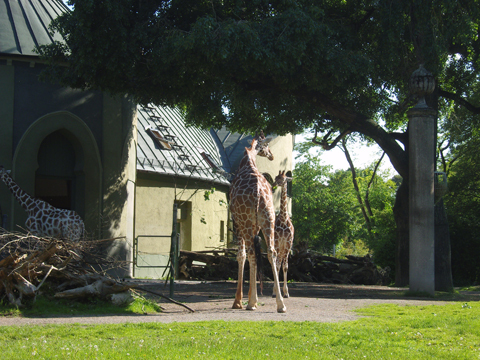 It was already time for the Zoo to close when we approched the giraffe enclosure. In the evening sunlight their markings were simpy beautiful. I really love those animals! My love for visitng zoos is one of the many things I owe to Berte Bratt and her books. 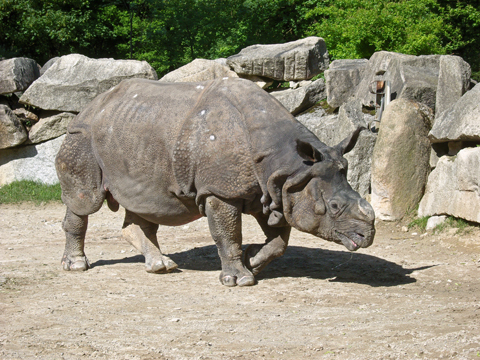 After Hellabrunn the next zoo we plan to visit is the one in Salzburg. Has anybody been there so far? Ahhh, ich liebe Zoos ja auch sooo sehr. Bisher war ich aber nur in München, Nürnberg und Wien. Nürnberg hat ja ein Delfinarium, aber ist wirklich schon sehr lange her dass ich dort war. Sicher 13 Jahre. Kann also sein, das sich dort einiges geändert hat. Der in Wien ist aber wirklich wärmstens zu empfehlen. Ich war total begeistert, wie schön die Gehege angelegt waren und zu einigen Gehegen gab es solche Aussichtsplattformen von denen aus man direkt von oben reinkucken konnte. Ich glaube, die haben den Zoo erst vor kurzem renoviert. Ist auf jeden Fall einen Besuch wert. Eines ihrer Bücher spielt dort und seitdem möchte ich unbedingt Schönbrunn sehen, ganz zu schweigen vom Zoo! My dear friend, I’m so so happy to be able to read your blog! It’s so great and I’ll visit it regularly! I also like zoos a lot, there’s a great and beautiful near here where Guillaume and I go twice a year, it’s a important place for us and I like it so much, I go there since I’m a child! We plan to go there next week, hoping the weather will be better. Your photos were really beautiful and cute! I have no time to talk more, we have to go to the library. Thanks a lot for your cute letter!